Stay connected in style with the LG Watch Urbane Smartwatch in gold with a brown strap. This watch features a stainless steel case, a leather strap, and a 1.3" round P-OLED touch display. It connects to your Android or iOS smartphone via Bluetooth 4.1 and uses the Android Wear operating system, which displays alerts and important info as well as responding to voice commands. Along with Android devices, the Watch Urbane is compatible with iOS devices running iOS 8.2 and up with limited functionality. 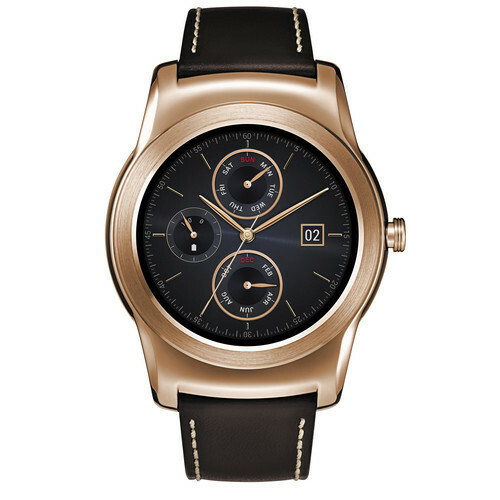 Box Dimensions (LxWxH) 5.3 x 5.0 x 3.1"
Watch Urbane Smartwatch (Gold with Brown Strap) is rated 4.4 out of 5 by 28. Rated 5 out of 5 by Anonymous from Great Fit and Practical I bought this watch Sight Unseen and thought it was going to be too large for my wrist after reading some other reviews. But after I tried it on it looked totally normal and didn't feel as bulky and cumbersome as I thought. I was mainly interested in buying a watch because my friends started buying these fancy name brand watches. So I wanted to be different and bought a smart watch. This was hands down a waaay better decision than buying a regular watch. There are a lot of uses for it and it gets a lot of positive attention even when Im with my friends who have watches that cost 10 times as much. Overall I am very satisfied and the only thing I would change is the band which I plan on doing soon. Rated 3 out of 5 by Anonymous from Great watch but no WI-FI! I got my LG Urbane last week, its a nice watch and works decent with my iphone6. Looking at various reviews of LG Urbane and based on the details provided by LG in the LG Urbane watch manual - I was under impression that this watch supports Wi-FI. But the model sold by BHPhoto doesn't have any wi-fi option under settings!! My LG Urbane is running with latest software but still no wi-fi. I tried reaching out to BHPhoto support over chat but they redirected me to LG support. I spoke to LG support and as per them all LG Urbane watched should have WI-FI support and LG support recommended me to talk to BHPhoto. I haven't found an explanation yet on missing WI-FI, planning to return my LG Urbane and buy it from a different retailer. Rated 5 out of 5 by Burly127 from Really Like this watch This is a great watch and looks good on. Works on IOS with Limited Functionality( (no companion apps or free watch-face making apps) and no WIFI (Apple blocks it),but I still get all my notifications on the watch as well as any google now cards. I can ask google to set a reminder too for example. You could easily get a day and a 1/2 to 2 depending on usage before having to charge it. Has much more functionality on an Android device and WIFI. When you first get it there are multiple updates/downloads that have to happen to get it to the latest firmware. I wonder if that is why previous reviewer so watch draining. These downloads can take a long time with Apple IOS because they have to be done over Bluetooth. I really like the watch even though I am using it with an iPhone. It looks much classier than Apple Watch and I have gotten many compliments on the look. Rated 5 out of 5 by Morry from Terrific!!! This watch it the best build you can get, it feels and looks much better on the wrist than anything else. It's smooth operation only cements it's position as a top smartwatch. For those with an iPhone who can't find wifi, it's because of Apple, not LG. I have an iPhone and an android tablet, when paired with the tablet wifi is there, when paired to the phone it is not. Rated 3 out of 5 by RV from Model sold by bhphoto doesn't have Wi-Fi option! I got my LG Urbane last week, its a nice watch and works decent with my iphone6. Looking at various reviews of LG Urbane and based on the details provided by LG in the LG Urbane watch manual of this watch - I was under impression that this watch supports Wi-FI. But the model sold by BHPhoto doesn't have any wi-fi option under settings! !My LG Urbane is running with latest software but still no wi-fi. I tried reaching out to BHPhoto support over chat but they redirected me to LG support. I spoke to LG support and as per them all LG Urbane watched should have WI-FI support and LG support recommended me to talk to BHPhoto.I haven't found an explanation yet on missing WI-FI, planning to return my LG Urbane and buy it from a different retailer. Rated 4 out of 5 by David from Would definitely buy it again. The LG Watch Urbane is alright. I don't know what I expected. I bought this watching thinking I'd be getting something that was feature rich and would have lots of interesting things built in. It does but wearable technology is still moving forward so it has far to go the watch itself is dope still ticking and working great, but doesn't have much that it can do yet. I think they have also evolved the wearable product with the 2nd version so this one is now far behind. it still has a great classic look without being too ostentatious. Rated 5 out of 5 by Engineer from worth every penny i use this watch every day. i have it sync'd with my work phone so i am getting notifications (especially email) quite often - and i still have approx 40% battery when i go to bed around 11pm (taking it off the charger around 6:30am). had to pay for a decent watch face creation app, but wow - that's all i have to say. Why is the gold style so much more expensive than the sliver? Prices are always subject to change. And at times one color can have a rebate or promotion, Currently at this time both watches are at the same price. Does this watch require a data plan? No. this connects to your Android smartphone via Bluetooth 4.1 and uses the Android Wear operating system, which displays alerts and important info as well as responding to voice commands. Can i use this watch without a smartphone? Does the watch heart rate? How do you talk on this if there is no speaker? Asked by: Michael T. K.